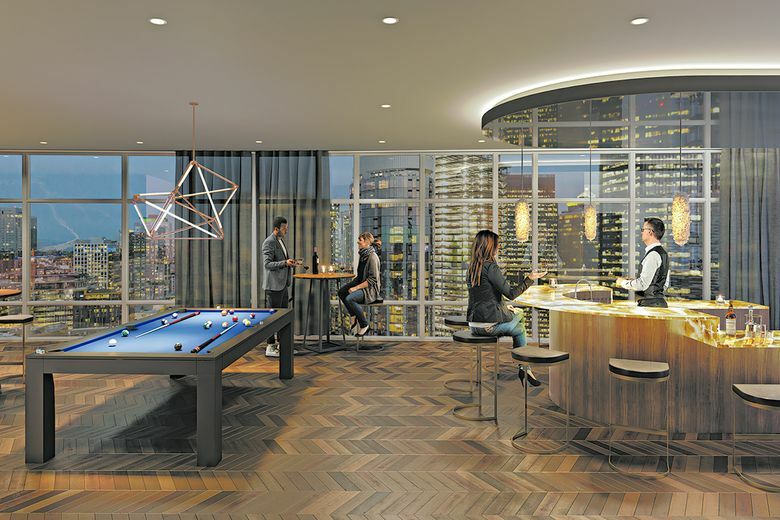 The SPIRE Club is an amenity facility that will feature a billiards bar and private dining room. A new 5,000-square-foot sales center for SPIRE has opened for public tours at 2218 Fifth Ave. in Seattle's Belltown neighborhood. SEATTLE — Individual presales have begun at SPIRE, a 347-unit, 41-story condominium high-rise under construction at 600 Wall St. in the Belltown neighborhood. A new 5,000-square-foot sales center has opened for public tours at 2218 Fifth Ave. Prospective buyers can view a full-scale model home, a design center, a 9-foot scale model of the tower, and immersive virtual-reality tours on a life-size display screen to help convey the final product offering. 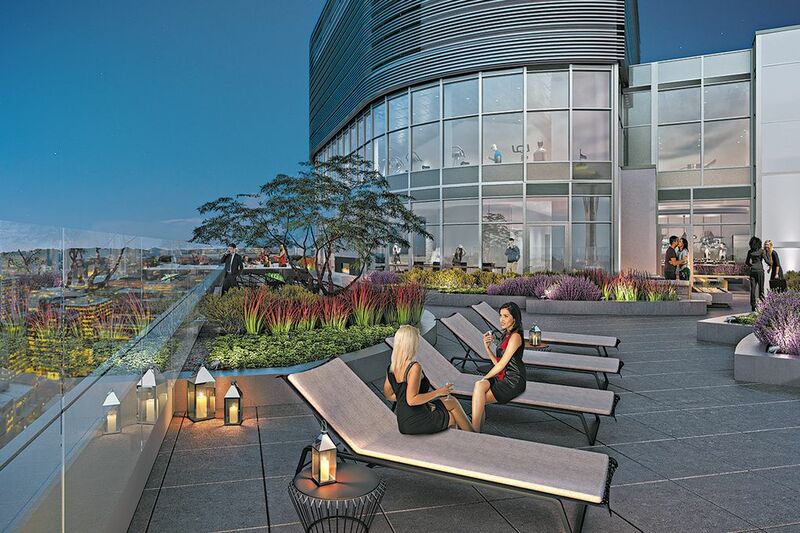 Leading up to the event, the SPIRE sales team accepted more than 100 first-position reservations along with several second- and third-position commitments on popular floor plans. Reservation activity has recorded more than $125 million in potential presales, which are being converted into sales, along with new transactions for prospective homebuyers who visit the sales center. 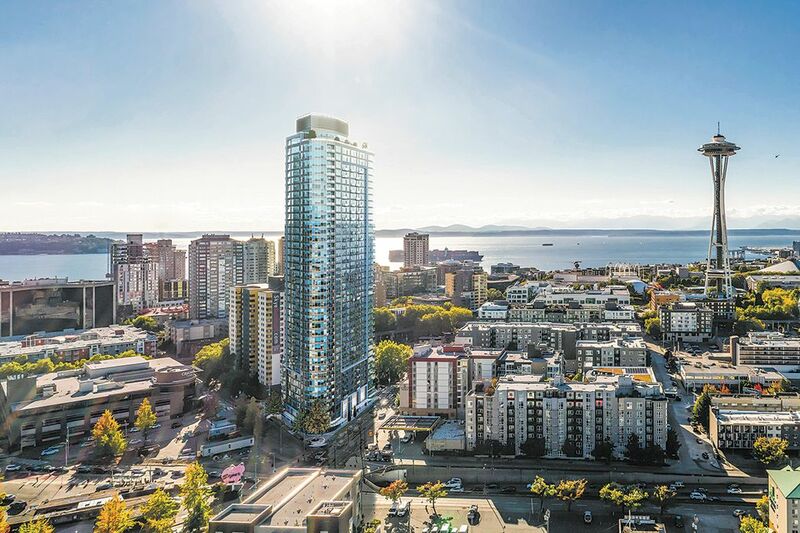 “We are pleased to witness such vigorous interest in SPIRE ahead of our formal sales debut,” says Paul Menzies, CEO of Laconia Development and representative of Seattle Realty One, LLC, the developer of SPIRE. Homes range in size from 530 to more than 2,800 square feet and feature 9- and 10-foot ceilings and broad window walls. A sample collection of unit listings are posted to the Northwest MLS, and additional inventory is released for immediate purchase. These presales identify a specific home with a set price and require a 5 percent deposit at the time of purchase, which will be held in escrow until the building is completed. Occupancy is expected by winter 2020-21 at SPIRE, now under construction on a full city block bound by Sixth Avenue, Wall Street and Denny Way. The 347 studio, one-, two- and three-bedroom residences are priced from below $500,000 to more than $5 million. They range in size from 530 to more than 2,800 square feet and feature 9- and 10-foot ceilings and broad window walls. SPIRE is a 41-story high-rise under construction at 600 Wall St. in Belltown. Its 347 homes will include studio, one-, two- and three-bedroom designs. The unique triangular-shaped lot at the northernmost boundary of Belltown provides for enviable tower spacing. To the south and east, view corridors frame impressive cityscape vistas, while to the west the views are unobstructed above the 18th floor as SPIRE towers over adjacent buildings. 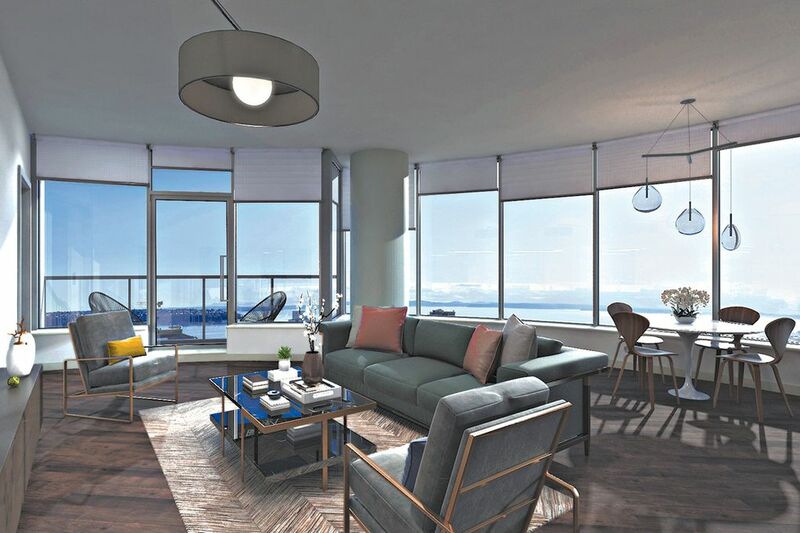 The views to the north and northwest are unobstructed because the zoning steps down to just 85 feet across Denny Way, affording panoramic vistas from Lake Union, across Seattle Center, Elliott Bay and the Olympic Mountains. Many of the homes boast iconic views of the Space Needle, which inspired the building name. Homeowners will enjoy custom-designed public spaces and residences with contemporary designs that blend craftsmanship, natural materials and technologically forward techniques. Features include Pedini cabinets, Bosch or Sub Zero/Wolf appliances and Kohler plumbing fixtures, as well as a choice of designer color schemes and options. Technology is woven throughout each residence, including SmartHome capabilities by Wipliance that allow residents to automate environmental controls through phones or tablets. One of the most unique offerings is the exclusive access to an automated valet parking system designed by Sofetin. SPIRE also offers a robust collection of amenities, including a dramatic two-story lobby with concierge station and retail services. The third floor features a co-working lounge with Skype room, conference room, gaming room and wellness studio for spin classes, yoga and stretching. A guest suite will be offered for overnight visitors. Above all is the SPIRE Club, a two-level lifestyle center that boasts an exhibition kitchen and private dining room, a billiards bar, an art gallery and lounge, numerous terraces, a barbecue deck, a dog run, and a fitness facility with wraparound views of the city, lake and bay.